Andre Gripel, forever in Mark Cavendish's shadow on HTC, finally broke through to win Stage 10. 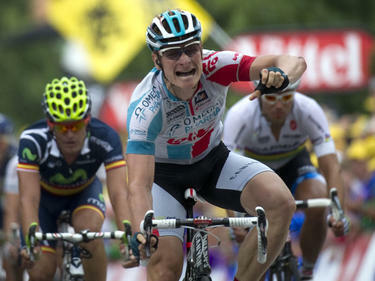 The sprint was brilliant, and Gripel timed his burst perfectly to beat Cavendish by inches and win his first stage. This year's Tour, full of first timers making massive impact, has been as unpredictable as any I've watched. Cavendish, while amazing, hasn't had the lock down dominance he once had. Don't get me wrong, he's by no means done, but I will say that others are getting closer to him and raising their game to match his. After a week of brutal wrecks, today was one of calm in the Peleton. Johnny Hoogerland and Juan Antonio Flecha showing the kind of spirit to compete that defines the race itself. The decision to give both of them the Red Number for the Most Aggressive Rider was a first in the history of Le Tour. As Leipheimer said on Twitter "they deserve more." Hoogerland is still resplendant in Poka Dots and hopefully his body will recover as the week progresses and he'll be able to defend the jersey. Speaking of resplendent in a jersey, watching the Yellow and Green fight for the win in the last few kilometers was awesome. Both men are fighting to retain their place in the order, and given Gilbert's effort, you have to root for him to hold onto Green into Paris. Great intermediate stage, but the Pyrenees loom large... soon the Mountains Full of Hate will come home to test the riders after so many crashes. Is Contador's body in any shape to climb? Who will "dance on the pedals" starting today? Hmm, I didn't know anybody in the USA is interested in le grand boucle. Just recently read in a Swiss newspaper that the biggest problem for the riders' safety are the riders themselves as they're trying to take advantage of every oportunity and go hard at the limit to win.